Staying out of a meal planning rut is easy when you have a bunch of simple recipes on hand! All of these ground turkey recipes are family-friendly and easy to make. 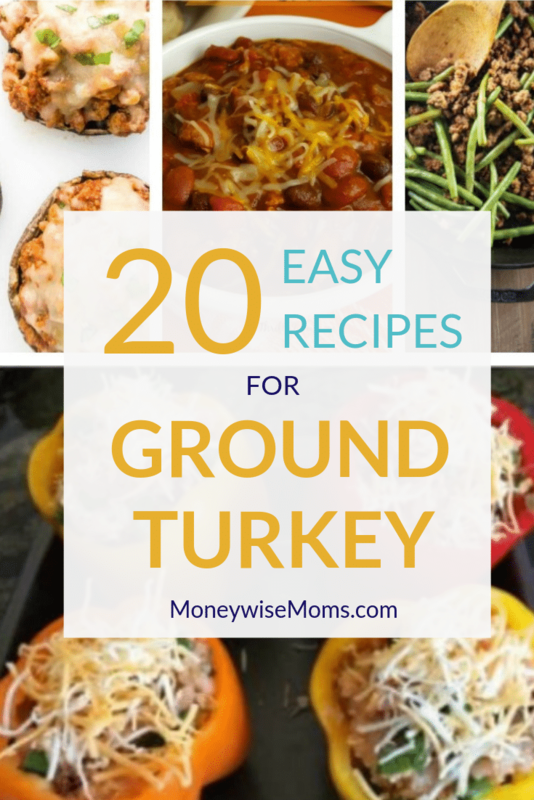 Does your family love ground turkey as much as mine? I buy the four-packs of ground turkey at Costco, so there’s always some in the freezer ready to prep one of these dinner ideas. Want to meal prep ahead of time?I cook the ground turkey along with a chopped onion in my favorite skillet. Then, after it cools, I freeze it in zipper bags to get a head start on busy weeknights. It’s easy to add to spaghetti sauce or saves me time with another recipe that needs cooked meat. Take a look at these easy ground turkey recipes. Pick something that is new-to-you and give it a try! Need more ideas? Here are 20 more! And one of my most popular posts ever! These are my Amazon links–thanks for supporting MoneywiseMoms at no cost to you! Awesome! Pinning for later. I always use ground turkey. I’ve completely stopped using ground beef. 🙂 Thanks for sharing at Dishing It & Digging It! We buy the 4 pack of ground turkey from Costco too! We have eaten ground turkey for so long that my 10 year old doesn’t know it from ground beef. Thanks for sharing these great recipes on #TurnItUpTuesday!